Update (10 PM EST): Added official Patch 5.4.7 Notes! Build 17807 will be deployed to the PTR realms soon. 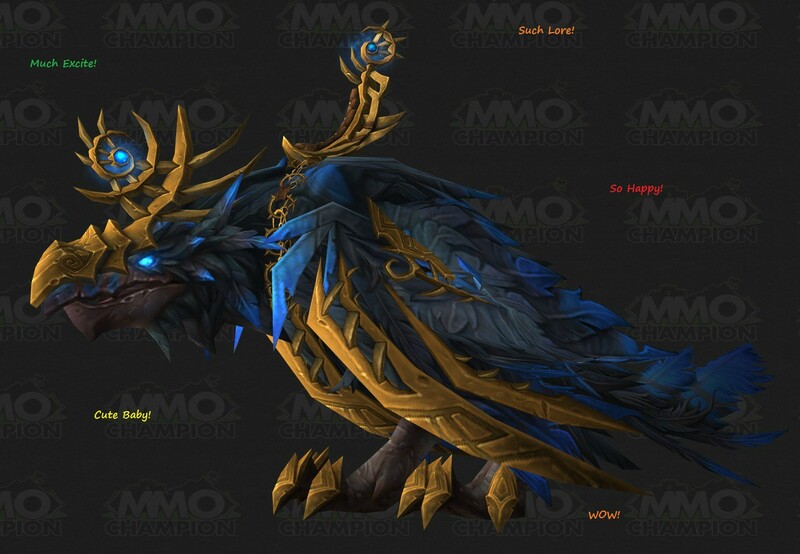 Reins of the Dread Raven and Dreadful Egg are likely to be the Collector's Edition rewards. This PTR build added strings that indicate testing of the Level 90 boost. This includes the free boost that comes with Warlords of Draenor, as well as a paid boost feature. Other changes indicate that Character Services may also be added to in the in-game store. Another interesting string was added: CHARACTER_UPGRADE_NO_VETERAN_BONUS - No Veteran Bonus. It likely has to do with another string: CHARACTER_UPGRADE_PROFESSION_BOOST - Veteran Bonus: Level 60+ characters will also receive a skill level boost to their primary professions. You can see all of the new items on the WoWDB PTR site. Rare spawns in Krasarang Wilds now only award Honor Points when they are defeated for the first time each day. Battle Fatigue now reduces healing received while in PvP combat by 65% (up from 55%). Dampening is now applied to an Arena match starting at the 5 minute mark (down from 10 minutes). Many of these changes are just tooltip updates for hotfixes. 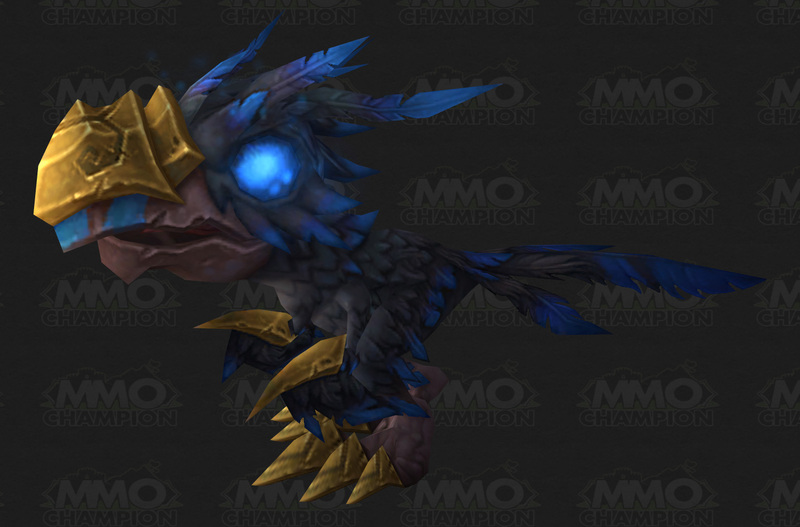 Dread Hatchling (New) Right Click to summon and dismiss your Dread Hatchling. Battle Pet. Instant. Necrotic Strike A vicious strike that deals 100% weapon damage, absorbs the next AP healing received by the target, and clouds the target's mind, slowing their casting speed by 50% (25% 10% on player targets). Lasts 10 sec. Melee range. Instant. Icy Talons Your melee attack speed is increased by 30%. Death Knight - Frost Spec. 45%. Death Knight - Frost Spec. Unholy Might Dark power courses through your limbs, increasing your Strength by 25%. Death Knight - Unholy Spec. 35%. Death Knight - Unholy Spec. Spore Cloud Dusts nearby enemies with spores, reducing the casting speed of all enemy targets within 6 yards by 50% (25% 10% on player targets) for 10 sec. Special Ability. 6 yd range. Instant. 8 sec cooldown. Glyph of Remove Curse Increases the damage you deal by 15% 5% for 10 sec after you successfully remove a curse. Major Glyph. Shadowform Assume a Shadowform, increasing your Shadow damage by 25%, increasing your armor by 60% 100%, and increasing all party and raid members spell haste by 5%. However, you may not cast Holy spells except for Renew, Prayer of Mending, and Leap of Faith while in this form. Priest - Shadow Spec. 2.6% of Base Mana. Instant. Mind-numbing Poison Coats your weapons with a Non-Lethal Poison that lasts for 60 min. Each strike has a 50% chance of poisoning the enemy, clouding their mind and slowing their casting speed by 50% (25% 10% on player targets) for 10 sec. 3 sec cast. Elemental Focus When you land a non-periodic critical strike with a Fire, Frost, or Nature damage spell, you enter a Clearcasting state. The Clearcasting state reduces the mana cost of your next 2 damage or healing spells by 25%, increases spell damage done by 15% 20%, and increases single-target healing done by 50%. Shaman - Elemental Spec. Curse of Enfeeblement (Affliction) Binds the target in demonic energy, reducing physical damage by 10% and increasing the casting time of all spells by 50% (25% 10% on player targets) for 30 sec. Curse of Enfeeblement (Demonology, Destruction) Binds the target in demonic energy, reducing physical damage by 10% and increasing the casting time of all spells by 50% (25% 10% on player targets) for 30 sec. Aftershock Deals 700,000 Fire damage to enemies within the aftershock and grants General Nazgrim 2 1 rage for each target struck. 1,000 yd range. 3 sec cast. Deafening Screech Inflicts 240,000 Inflicts 200,000 Physical damage to all enemies and interrupts spellcasting for 2 sec. 100 Mana. 3 sec cast. 1.5 sec cooldown. Empowered Chain Heal Heals an ally for 4% 1% of their maximum health and jumps to a nearby ally, increasing healing by 50% per jump. Affects 5 total targets. 50 yd range. 2.5 sec cast. Fire Storm Fires a rocket barrage that inflicts 15,304 10,000 Fire damage every 0.75 sec. to random enemies 100 yd range. 3 sec cast. Healing Tide Heals allies within 8 yards for 2% 1% of their maximum health every 3 sec. Instant. Ravager Throw a whirling blade, inflicting 200,000 100,000 Physical damage to enemies within 6 yards every 1 sec. and granting General Nazgrim 1 0 rage for each enemy struck. Instant. Shock Blast Inflicts 70,000 Inflicts 63,000 Nature damage to random enemies. 300 yd range. Instant. War Banner Increases melee, ranged, and spell casting speed by 25% 50%, and also increases damage dealt by 55% 50% for all friendly targets within 15 yards for 2 min. Instant. BLIZZARD_STORE_BEING_PROCESSED_CHECK_BACK_LATER - Your order is being processed.\nPlease check back later. BLIZZARD_STORE_ERROR_MESSAGE_PARENTAL_CONTROLS - Purchasing is disabled by Parental Controls. Please visit Account Management. BLIZZARD_STORE_ERROR_MESSAGE_PURCHASE_DENIED - Please contact Customer Service. BLIZZARD_STORE_YOU_ALREADY_OWN_THIS - You already own this item. CHAR_LOGIN_LOCKED_BY_CHARACTER_UPGRADE - You cannot log in until the character boost process you recently initiated is complete. CHAR_LOGIN_LOCKED_BY_REVOKED_CHARACTER_UPGRADE - This boosted character is locked out due to a billing issue. CHARACTER_SERVICES_NO_ELIGIBLE_CHARACTERS - None of your characters on this realm are eligible for this service. CHARACTER_SERVICES_PLEASE_WAIT - This may take several minutes. CHARACTER_UPGRADE_CHARACTER_LIST_CHANGED_ERROR - Something went wrong. Restarting the upgrade process. CHARACTER_UPGRADE_FREE_CHARACTER_UPGRADE_DESCRIPTION - Thank you for joining us in Warlords of Draenor!\nHere's a free level boost for one of your characters. CHARACTER_UPGRADE_KRW_FINISH_BUTTON_POPUP_TEXT - Are you sure that you want to boost this character? If you click the ï¿½Level Upï¿½ button, you will no longer be eligible for a refund. CHARACTER_UPGRADE_KRW_STATIC_WARNING - You can cancel this purchase within 7 days from the time of purchase. However, you can no longer cancel this purchase once you have completed all the steps to boost your character, even if it's within 7 days from the time of purchase. CHARACTER_UPGRADE_READY - Your Level 90 Character Upgrade is Ready! CHARACTER_UPGRADE_READY_DESCRIPTION - Log out to upgrade your character. You can do this at any time. DEVICE_BLACKLISTED - Your video device is not compatiple. Plese see http://enUS.nydus.battle.net/WoW/enU...eo-unsupported for more information. DRIVER_BLACKLISTED - Your device driver is not compatiple. Plese see http://lgLG.nydus.battle.net/WoW/lgL...er-unsupported for more information. DRIVER_OUTOFDATE - Your device driver is out of date. Plese see http://enUS.nydus.battle.net/WoW/enU.../driverupdates for more information. ERR_LFG_MISMATCHED_SLOTS_LOCAL_XREALM - You cannot mix realm-only and x-realm entries when listing your name in other raids. SHADERMODEL_UNSUPPORTED - This video card will not be supported in future versions of World of Warcraft. Please see https://battle.net/support/article/w...nction-support for more information. There are far too many minor weird things happening specifically to Karazhan over the past few months. Call out my tinfoil hat all you want, but I can't help but think something is actually happening at this point as opposed to just "loll we keep getting bored and we hate cobwebs". it's pretty obvious that the stormcrow isnt a store mount if you just used you're brain. the scorpion that drops is a mechanical monstrosity full of saws and fire and lazers. It's awesome. I have no idea what you're mad about. Just seems like people are scraping the bottom of the barrel for negative things to say about WoW again. Whatever. I'm done with arguing with people over the exact definition of "P2W". The point is, it's now a money game. 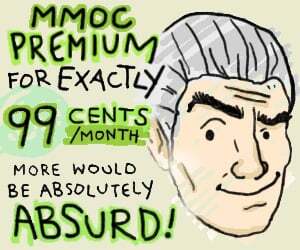 All $15 a month gets you is an opportunity to play as a second class citizen next to the cash shop using aristocrats. It really isn't, nothing in the blizzard store gives any in game advantage over those that do not use it. LOL. Let's make the Alliance's defensive apparatus even stronger and more durable. That will fix AV. The NPCs at the bunkers are already a PITA to kill, lets buff them ... good luck capping bunkers now especially if Alliance decides to interfere. Nobody else noticed this lazy typo then? "Dread Raven (New) Summons and dismisses an Imperial Quilen." If this is indeed the new expansions collectors edition rewards, i find it rather silly, as unless you return to old worlds, you cant use it till 6.1. I know a ground mount is not as appealing to the eye or the brain, but would have made more sense. Why wouldn't you be able to use it? It has walking animations and is using the same skeleton as the Armored Skyscreamer -- a mount that scales with your riding and can be used in bgs. Ok, i worded it badly. You can use it, but most flying mounts look silly running on the ground, if we are forced to stay grounded i would prefer, and will use a real ground mount. This is a flying mount. This is a scaling mount that will work as both a ground and flying mount. Complain away. I'm really looking forward to my CE mount this time. Quilled was ugly, but anzu, such lore, so happy, cute baby, much excited. Ejpaints, your post made me laugh so hard that I just HAD to make this. If you think about it, that is very similar to the way konami titles their Castlevania series. Which is double interesting since the pre-wrath launch had a Castlevania homage that was in kara. lol ok most likely collectors thats good since i planed to get the collectors edition anyways. I stopped at Wrath, haven't had a collector's edition since then. Had 'em all up until then.